AIM Altitude has created concept front-row monuments (FRMs) to showcase its abilities in the design, engineering and manufacture of unique, customised cabin furniture. 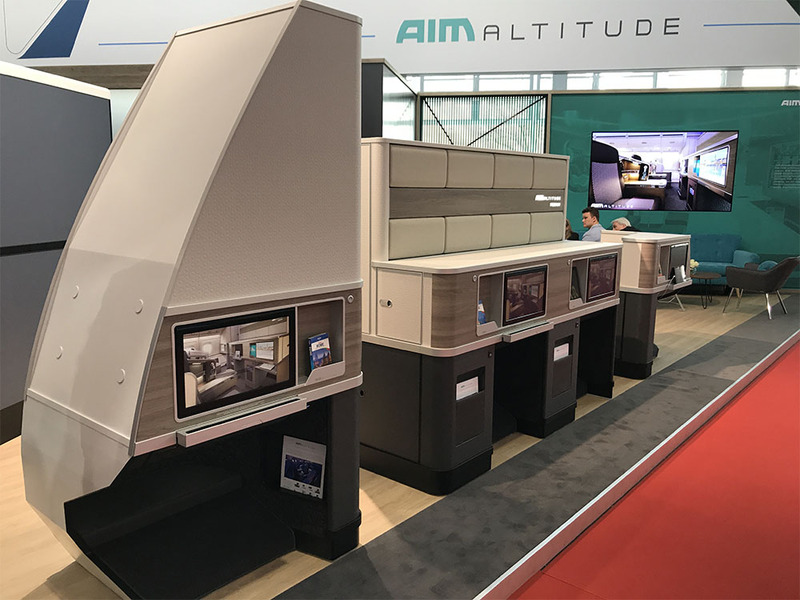 The prototype FRMs were showcased at AIX 2018 and followed AIM Altitude’s platform approach, which provides seamless integration with the seating. Working beyond the ever-increasing ambitions of the airlines, AIM Altitude has made colour, material and finish enhancements, as well as incorporating additional features for passenger comfort, airline efficiency, and brand differentiation. The clever design allows the lower half of the units to remain the same, with three different upper-half arrangements, demonstrating the flexibility of the FRMs. The configurations include a full-height closet, an under-bin closet with branding panel, and a half-height closet with provision for a baby bassinet. AIM Altitude has worked on the FRMs in collaboration with Thompson Aero Seating, a partnership that has become even closer now that the two companies are both owned by AVIC. The central units have been designed to meet the standard width for Vantage XL seating, while the outboard units have a wider footwell area. The footwells themselves have quickly-removeable acoustic linings, with exciting new trim and finish capabilities, including soft raised patterns that can be matched to the innovative 3D laminate design on the vertical surfaces. A branding panel has also been incorporated into the central unit, displaying new lighting and cutting techniques for razor-sharp definition. Enhancing the passenger experience, AIM Altitude has worked hard to ensure greater storage options and to incorporate the use of new technology. Each FRM has laptop storage in a new ‘glove-box’ option and a deployable tablet stand, so that personal content can be viewed in normal seat mode or in sleep mode. Coat hooks, literature holders, and personal lockers all add to the options. AIM Altitude set its own brief to create a set of FRMs to fully integrate with the seating and enhance the chosen business-class seat. The platform is essentially an internal frame or ‘skeleton’, which remains the same for each installation. The external elements of the FRM are bespoke, and customised to reflect the unique brand and specific requirements of each individual airline. The platform has been created to work with AIM Altitude’s FRMs and Thompson Aero Seating’s Vantage and Vantage XL seat range. The seamless transition provides greater styling and aesthetic cohesion, and minimises certification challenges. Working from a standard platform helps to simplify the design stage and also reduces manufacturing lead times. The concept FRMs will be available to be viewed by appointment at AIM Altitude’s own Customer Experience Zone at its headquarters in Bournemouth, UK.